After years of research, now with the right prodding, scientists can transform human embryonic stem cells (hESCs) into virtually any cell type in the body. That’s what makes hESCs such an appealing cell source to repair all sorts of diseases and injuries like heart failure, Parkinson’s disease, spinal cord injury and the list goes on. But any of these treatment strategies must reckon with a big elephant in the room: our immune system. 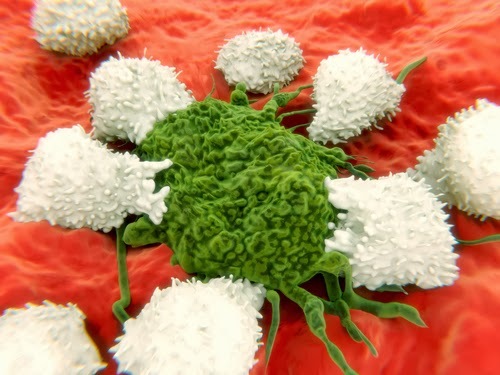 Since the hESCs are not originally from the recipient, once transplanted, the patient’s own immune system is likely to reject and kill these precious cells. Immunosuppressive drugs are available but by virtue of the drugs’ dampening effects on the entire immune system, long-term use of these drugs invite an increased chance of infection and cancer. Yesterday, a collaborative research team including scientists from China as well as CIRM grantees from the University of California, San Diego reported in Cell Stem Cell a means to overcome part of this hurdle. They harnessed the body’s natural immune system “brake pedals” by genetically engineering two key genes into human embryonic stem cells. These two genes produce proteins that inhibit activation of T cells, the cells primarily responsible for immune rejection. To show that this strategy could work in people, the team tested various cell transplants into “humanized” mice whose immune system had been removed and rebuilt with human immune cells. When injected in the skin of these mice, normal human embryonic stem cells were attacked by T cells and rejected. But the stem cells genetically altered to churn out the immune system “brake pedals” avoided rejection when injected into mice. In addition, heart muscle cells grown from these stem cells also escaped rejection when injected. In an important follow up experiment, the team showed that injection of the modified cells does not lead to body-wide immune suppression like you would see with immunosuppressive drugs. They injected the heart muscle cells derived by both the unmodified and modified hESCs in the opposite hind legs of the same animal. Again, the modified muscle heart cells escaped immune rejection but the heart muscle cells from the unmodified stem cells still were rejected. This is an especially promising approach, because it avoids the toxic side effects of the drugs now used to suppress the rejection response, and therefore this is an important step forward in showing the feasibility of using human embryonic stem cells from unrelated donors. very great information..I really impressed to read all that great information..your information s very impressive and attractive for all..thanks for sharing all that great information..